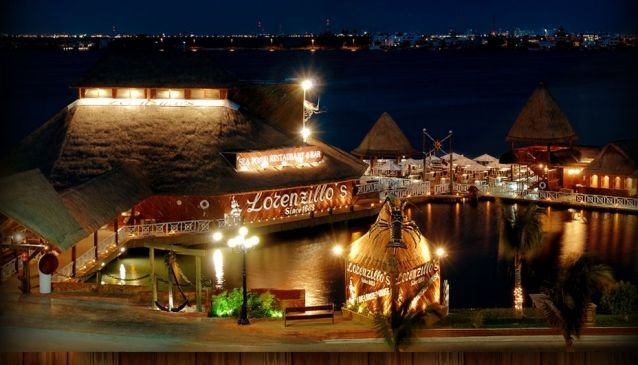 Lorenzillo's top-notch lobster is the highest-rated in Cancun due to the fact that the restaurant owns its own lobster farm and the fish is fresh and well-kept. This elegant restaurant has a breath taking panorama as it is situated on the turquoise lagoon where you can see some of the best sunsets in your life. The outdoor setting is splendid, concealed under exotic palapas and overlooks the marina. Beautiful living area, separate bar, open kitchen and an amazing wine cellar are also included and add-up to the casual atmosphere. The rich, diverse menu is at your disposal and offers exquisitely prepared sea food, delicious specials and desserts, Russian, Japanese and Chinese dishes. This restaurant is located in the zona hoteliera close to the Grand Park Royal Cancun and it is very easy to find.